Swansea City striker Alex Samuel has extended his loan at Morton until the end of the season. The 20-year-old's initial deal was due to expire on 9 January but the Premier League club have allowed a further spell. "We were unsure how things would work out given the new management structure at Swansea," Morton manager Jim Duffy told BBC Scotland. "We were hopeful a deal could be agreed and are delighted it has happened." Samuel scored four goals in 16 appearances during his first stint at Morton, but while in Scotland Alan Curtis replaced Gary Monk as manager of Swansea. Declan McManus had earlier joined Morton on loan until the end of the season from League One side Fleetwood Town. He scored 23 goals on loan at the Greenock side from Aberdeen last season before deciding to move to England. 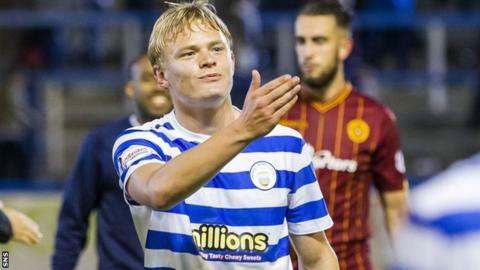 Morton are away to Livingston in the fourth round of the Scottish Cup on Saturday.